• Comes with a log file viewing tool – TurboLogViewer which offers many handy features like collapsing/expanding log • sessions, syntax highlighting, bookmarking etc, all making viewing and analysing log file much easier. • Site Address Book – sites organized in a tree structure. Easily organized with drag and drop, copy and paste. • Can import site information from CuteFTP, WS_FTP, Bulletproof FTP, LeapFTP and FTP Explorer. Support all formats of • • • CuteFTP site information data file and can import passwords – tree.dat, smdata.dat, SM.dat. • Bookmarks – one-click access to any local/remote folder. • Remote editing – edit and update web page online. • Download/upload speed limits – reserve bandwidth (for e.g. web browsing) while transferring files. SpaceClaim is the world’s fastest and most innovative 3D solid modeler. It gives engineers and industrial designers the freedom and flexibility to capture ideas easily, directly edit solid models regardless of their origin, and simplify designs in 3D for analysis, prototyping, and manufacturing. SpaceClaim lets extended design and engineering teams work concurrently, finish projects at a fraction of the cost, and accelerate time-to-market. With SpaceClaim 3D design software, you can edit 3D designs based on your intent, regardless of how the model was created, and experiment freely with design concepts, unrestricted by complex parameters and restraints. Intuitive tools such as Pull and Move let you directly select portions of the model and put them where you want. The Combine tool slices divides parts into pieces and lets you merge in portions of other designs. The Fill tool cleans up small features and fills holes. Take designs where you want them to go without worrying about how to get there. Using SpaceClaim 3D Direct Modeling drives innovation and improves collaboration. 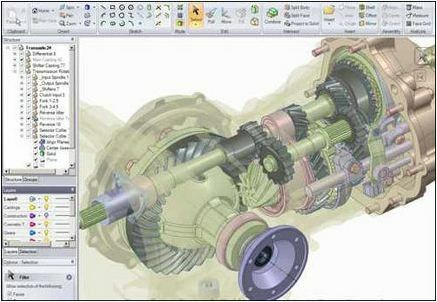 While feature-based CAD products are very powerful for detailed design work, they are not appropriate for conceptual design, engineering analysis, and simulation-driven design. SpaceClaim is easy to learn and use, cost effective, and very accurate, enabling 3D conceptual design by everyone and driving improved innovation and collaboration. The product’s open file format and data exchange capabilities makes it easy for people to share designs and ensure that they fit within the existing development process. SpaceClaim supports common formats ACIS, STEP, IGES, ECAD, Rhinoceros, CGR, DWG, DXF, STL, OBJ, XAML, VRML, and 3D PDF (requires Adobe Acrobat 9 Pro Extended). Designed specifically for engineers, SpaceClaim Engineer is the world’s fastest and most innovative 3D direct modeler. It enables engineers to easily create concepts and prepare 3D designs for prototyping, analysis, and manufacturing. SpaceClaim Style brings the freedom of direct solid modeling to industrial design. It accelerates product ideation by providing flexible tools to create, edit, and validate design concepts. To help you decide which product is the best solution for your needs, the following chart briefly describes the differences between SpaceClaim Engineer and Style. Want to share a SpaceClaim design with a client, but your client doesn’t use 3D? Have you ever wanted to measure a model using the shop computer? Would the CAD team benefit from being able to load your SpaceClaim 3D markups in 3D? If so, you might want to try the free SpaceClaim Viewer which lets anybody open and measure SpaceClaim designs, drawings, and 3D markups. A variety of add-on modules are available to extend the functionality of SpaceClaim. Optional modules include data exchange packages for Pro/E, Inventor, CATIA, VDA, Parasolid, SolidWorks, and NX, as well as a TraceParts library and a module to allow Bunkspeed HyperShot interactivity with SpaceClaim. ALGOR and SpaceClaim offer a complete design-to-analysis solution for smooth and efficient computer-aided engineering (CAE) workflow in a special bundle package offering called SpaceClaim 3D Simulation. With it, engineers can import virtually any solid model geometry and create a neutral file format for input to ALGOR. SpaceClaim 3D Simulation software lets you create, edit, and prepare models for analysis to verify multi-part, multi-material 3D models with detailed stress analysis. It breaks down design-to-analysis barriers so participants in the design-to-analysis workflow can contribute more efficiently and productively. By allowing more design iterations than ever before, this “click-and-do” software lets contributors get truly creative. Use it to test the behavior of product designs, speed time-to-market, make better, safer products at less cost and deliver the final product comparison to the design originator. 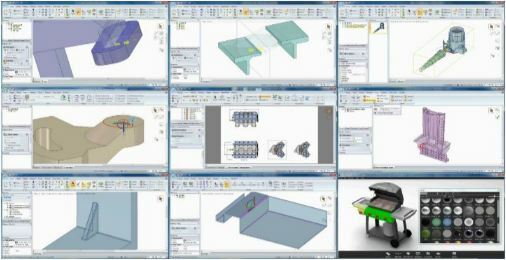 With SpaceClaim 3D Simulation, contributors around the organization are now truly part of the workflow team. As a multi-tasking OS, Windows® allows you running multiple programs simultaneously. As a result, you have a few windows open at any time. But when working with lots of applications, your desktop can easily become overcrowded. Actual Virtual Desktops will help you resolve this problem – you can allocate and classify all of your windows by moving them to virtual desktops. Actual Virtual Desktops provides a “virtual" space – as if you have several logical monitors instead of a single physical one. You can extend the real estate of the workspace and move a window from virtual desktop 1 to virtual desktop 2 etc. The actual number of virtual desktops is not limited! Create one virtual desktop solely for watching video files and listening music, another one – for chatting or reading books, put your email client and browser windows on another and your text editor and debugger on a fourth one etc. Each virtual desktop – for a separate task. In such a way switching between desktops means switching between tasks. 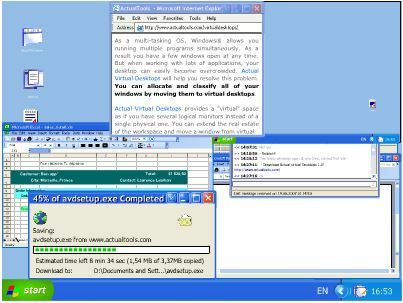 Actual Virtual Desktops optimizes the work with several tasks and you get a quick access to all launched applications! Allocating windows between desktops can be done in a wink, either automatically at window startup or manually: via special title button/window menu item or via “Move to next desktop"/"Move to previous desktop" hotkeys. Choose the best option on your own! To underline each desktop’s look-and-feel, assign custom wallpapers to each virtual desktop and name them in any way you like: for example a desktop for playing video and listening music can be called “Multimedia" etc. Special Virtual Desktops Switcher window allows the quick and easy virtual desktops management. It displays the number of cells equal to the number of virtual desktops. Each cell contains the icons of applications running on that cell’s corresponding virtual desktop. Actual Virtual Desktops makes it possible to see applications’ windows needed for accomplishing the required task. Need to solve another task – simply switch to another virtual desktop with the already prepared windows for it. Actual Virtual Desktops lets working with a bundle of windows open at a time and you won’t lose time finding the required one! Classic – in this mode you have a single list of desktops, and each desktop spans all available monitors (i.e. the switching of desktops affects all windows on all monitors). Independent – this mode allows you treating each monitor as a separate workspace with its own set of “screen pages". In other words, when you switch the desktop on certain monitor – it affects windows only on that particular monitor; on other monitors, windows stay intact. PGP Desktop is a security software to combine personal firewall, intrusion detection, VPN client, and encryption technologies into a single solution that fully protects computers against intruders and theft/loss of data. Whether employees work at home or in the office, it provides seamless protection from cyber-hijackers, easy-to-use e-mail and disk encryption, protects integrity of the companies information, controls access to files, and offers a host of other important security features. 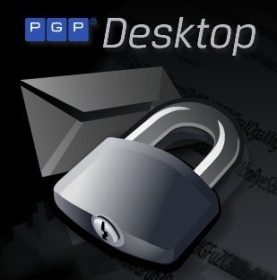 · PGP Desktop: A software tool that uses cryptography to protect your data against unauthorized access. Available for Mac OS X and Windows. · PGP Universal: A tool for enterprises to automatically and transparently secure email messaging for their employees. PGP Universal environments can include client software, called PGP Universal Satellite, which allows users in a domain protected by a PGP Universal Server to secure email messages all the way to the desktop. Version 9.0 and above of PGP Desktop includes the PGP Universal Satellite functionality, thus allowing PGP Desktop users to easily fit into a PGP Universal environment. · PGP Global Directory: A free, public keyserver hosted by PGP Corporation. The PGP Global Directory provides quick and easy access to the universe of PGP keys. It uses next-generation keyserver technology that verifies the email address on a key (so that the keyserver does not get clogged with unused keys) and lets users manage their own keys. Using the PGP Global Directory significantly enhances your chances of finding the public key of someone with whom you want to send secured messages. PGP Desktop is designed to work closely with the PGP Global Directory. · PGP Messaging: A feature of PGP Desktop that automatically and transparently supports all of your email clients through policies you control. Also protects many IM clients, such as AIM and iChat (both users must have PGP Messaging enabled). · PGP Disk: Whole Disk Encryption is a feature of PGP Desktop that protects your entire hard drive or drives, including your boot record, thus protecting all of your files all the time. Virtual Disk volumes are another feature of PGP Desktop that let you use part of your hard drive space as an encrypted virtual disk with its own drive letter. If you like, you can use Whole Disk Encryption and Virtual Disk volumes on the same system. · PGP Zip: A feature of PGP Desktop that lets you put any combination of files and folders into a single encrypted, compressed package for convenient transport or backup. You can encrypt a PGP Zip archive to a PGP key or to a passphrase, allowing you to send the archive to someone who does not even have PGP Desktop on their system. · PGP Keys: A feature of PGP Desktop that gives you complete control over both your own PGP keys and the keys of those person with whom you are securely exchanging email messages. · Shredding: A feature of PGP Desktop that lets you completely destroy sensitive data. PGP Shred overwrites files so that even file recovery software cannot recover them. · Smart cards and tokens: Smart cards and tokens are portable devices on which you can create your PGP keypair or copy your PGP keypair. Creating your PGP keypair on a smart card or token adds security by requiring the smart card or token in order to encrypt, sign, decrypt, or verify. So even if an unauthorized person gains access to your computer, your encrypted data is secure because your PGP keypair is with you on your smart card or token. Copying your PGP keypair to a smart card or token is a good way to back it up and an easy way to distribute your public key. · Conventional cryptography: Uses the same passphrase to encrypt and decrypt data. Conventional cryptography is great for data that isn’t going anywhere (because it encrypts and decrypts quickly). However, conventional cryptography is not as well suited for situations where you need to send encrypted data to someone else, especially if you want to send encrypted data to someone you have never met. · Public-key cryptography: Public-key cryptography uses two keys (called a keypair) for encrypting and decrypting. One of these two keys is your private key; and like the name suggests, you need to keep it private. Very, very private. The other key is your public key, and like its name suggests, you can share it with the general public. In fact, you’re supposed to share. 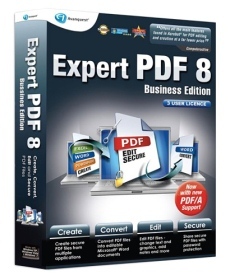 The software works with Windows 8, 7, Vista, 2003, XP and 2000, and recovers complete data from FAT32, VFAT, NTFS and NTFS5 based partitions and volumes. 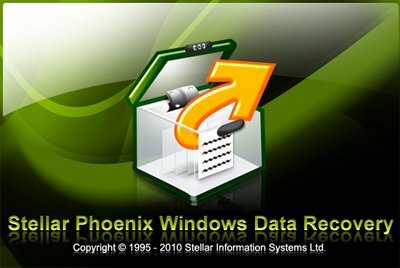 Stellar Phoenix Windows data recovery is powered by ‘Raw File Recovery’ feature that recognizes & recovers more than 300 file types including documents, spreadsheets, web content &images. Raw file recovery feature bail you out from the most severe data loss situations. Enhanced photo recovery support for all major digital camera file formats. • Windows Support: Recover data from Windows Vista, XP, 2003, 2000, 9x. storage media. • Advanced Search: Recover files from severly corrupted drives. Ace Utilities is an award winning collection of tools to optimize your PC’s performance. It allows you to find and remove the junk files in your PC, invalid registry entries, delete your internet usage history, provides plug-in support to erase the usage-history for over 200 third-party applications, manage your internet cookies and much more. With a detailed startup-manager you can see what all programs, services, drivers, etc start automatically with Windows and optionally disable them. Furthermore, Ace Utilities also includes options to find true duplicate files, fix or remove broken shortcuts and to uninstall software completely. Other features include secure file deletion, disk space analysis, an empty-folder finder and more. • Clean junk, temporary and obsolete files from your disks using a swift disk cleaner. • The most advanced registry cleaner to clean the Windows registry. • Control the applications that start automatically with Windows using a startup manager. • Uninstall applications easily and correctly. • Optimize, clean and boost the speed of your Windows. 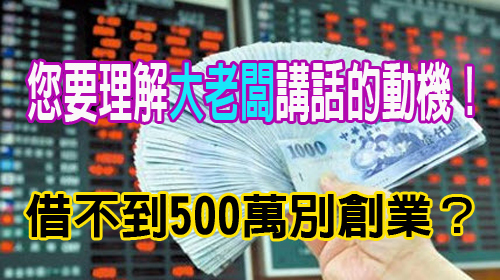 • Run applications smoothly and reduces crashes. • Block spyware, trojans, adware, etc. • No need to spend too much time; do it ultra fast. Added an option in Erase Your History > Internet Explorer: ‘Delete Crash Recovery Files’. Modified Cookie Manager to address the issue of Firefox v22 cookies not being displayed. Modified the ‘Clean System Registry’ to fix an issue where removing some entries of the MS Office 2013 was causing issues for certain users. FreeRIP is an advanced CD to MP3 Converter that comes packed with features. At its core, FreeRIP reads audio from your CDs and allows you to save them to your computer in a variety of digital formats including WMA, MP3, Ogg, Wav, or FLAC audio files (this process is known as CD ripping or CD to MP3 conversion). Converting your CD audio collection to digital audio files is a breeze with FreeRIP: download and install FreeRIP, put your audio CD into your computer’s CD drive, run FreeRIP and click on the Rip button.